For no reason at all. With thanks to Toby Hyde, whose daily Minor League recaps constantly remind me of all the great names in the Mets’ system. I originally intended to put out only a starting lineup, but once I started plumbing the system’s depths I grew indecisive and decided to go with a full 25-man roster. 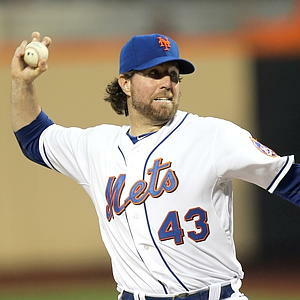 R.A. Dickey: Every team needs an ace. Dickey would probably crack the roster for the entendres alone, but adding that a) his first name is a set of initials that doesn’t include a J, which is somewhat rare; b) the initials in question are commonly used to refer to the guy confiscating your toaster oven in your freshman-year dorm; and c) his initials are RAD makes him a front-of-the-rotation guy. Dillon Gee: Probably underrated. Obviously there’s the West Coast rap connection, but also a slew of easy headline puns — GEE WILLIKERS! Also, did you know that Dillon Gee is the only Major Leaguer ever with the first name Dillon? It’s true. Casey Stengel’s middle name was Dillon, but every other Major League instance of Dillondom has been a surname. There have been 15 Minor Leaguers to date named Dillon, including a Dillon Thomas in the Rockies’ system. Jeurys Familia: Jeurys Familia is the only person ever named “Jeurys” to play affiliated baseball and, based on quick Googling, by far the most notable “Jeurys” in the world. As such, it seems like no one has any idea how to pronounce it. I’ve heard HAY-your-is, but the Buffalo broadcasters say “JAY-or-EES.” I tried to settle the matter myself when I interviewed him this year by introducing myself. “I’m Ted,” I said, extending my hand. “Familia,” he said as he shook. Hansel Robles: When I see “Hansel Robles” on the organizational depth chart, I think, “Oh, that’s right — the Mets signed a couple of dutch dudes a few years back.” But no, Hansel Robles was born in the Dominican Republic in 1990. Also, that Hansel is so hot right now: He’s got a 1.34 ERA in 60 2/3 innings at Brooklyn and has walked only seven guys all season. Rainy Lara: Another Dominican pitching in Brooklyn with impeccable control, Rainy Lara’s first name is an adjective describing a weather pattern marked by droplets of water condensing in the sky and falling to Earth. The possibilities for warmup music are almost endless, but I’d probably pick “Purple Rain.” I haven’t seen Lara pitch yet; it would help if he’s purple. Frank Francisco: We get so caught up in wondering why he’s still the Mets’ closer that we forget how great his name is. But it is. He’s the Los Angeles Angels of pitching, at least in terms of redundant names. Taylor Whitenton: Fun fact: Taylor Whitenton is the name of a character from Caddyshack played by William Zabka that was lost to the cutting-room floor. Richard Ruff: Stop! Drop! Shut ’em down, open up shop! Oh! No! That’s how Single-A pitchers with 1 1/3 innings above Rookie Ball roll! Flabio Ortega: The only Flabio to play affiliated ball (this will be a trend on the all-name team). Flabio sounds like a mean tabloid headline that’ll run whenever Fabio lets himself go. Jack Leathersich: The only lefty in the All-Name Team bullpen, Jack Leathersich was Clint Eastwood’s arch-nemesis in the Man with No Name Trilogy. Robert Gsellman: If I were Gsellman’s teammate in Kingsport I’d try to get the nickname “Typo” to catch on. Nabil Crismatt: I’ve got nothing. The only Nabil and the only Crismatt to ever play affiliated ball. Jean Luc Blaquiere: I studied art in grad school. The main thing you learn when you’re studying art in grad school is how to b.s. your way through art museums. If I saw a little tag next to an impressionist painting that said “Jean Luc Blaquiere,” I’d be all, “I find Blaquiere’s work a little contrived, but he really knows how to use paint.” Then you’d be like, “No, that’s just a stray leftover name tag from the Binghamton Mets’ field trip to the art museum; this is a Renoir.” And I’d say, “Oh, of course — haha, I was kidding.” But I wasn’t. Nelfi Zapata: The only Nelfi to ever play affiliated ball. Also, should team up with Binghamton outfielder Pedro Zapata and call themselves the Zapatistas, obviously. Xorge Carrillo: The only Xorge to play affiliated ball. Hard to think of a more badass first name. Valentino Pascucci: I assume you realized this was coming. It’s impossible to say “Valentino Pascucci” without using your hands at least a little bit. Before I ever spoke to Pascucci, when he was but a series of impressive Triple-A statlines, Matt Cerrone and I used to fantasize that I’d get him on the phone and he’d have a hilariously stereotypical Italian voice, like, “Hey! I just-ah hit-ah the homers!” He doesn’t, but he does hit-ah the homers. Merqui Marmolejos: The only Merqui to play affiliated ball. Another good headline name. If he’s really good at defense, maybe “Merqui De Sod!” If he turns into a talented but in some way flawed prospect, maybe, “Merqui Future.” Stuff like that. Yucarybert De La Cruz: For the first couple days of his life, Yucarybert De La Cruz’s parents intended to call him “Burt.” But it so happened that when the guy with the birth certificate came into the hospital room, they were in a little tiff over who’d hold him on the way home. So the guy said, “Hey, what are you going to call this little fella?” And his mom, who wasn’t paying attention, was like, “You carry Burt,” and the dad said, “You carry Burt!” So the guy with the form was like, “OK, Yucarybert it is,” and by the time anyone realized what had happened he had written it down in ink, and 18 years later baseball’s professional ranks got their first ever Yucarybert. At least that’s how it plays out in my head. Dimas Ponce: Famed conquistador of the Brooklyn infield. Also: Born on my 10th birthday. Ismael Tijerina: Maybe not quite up to the standards of the rest of the all-name infield, but we need a shortstop. ZeErika McQueen: Runaway winner of the system’s Best Name honors since he changed from ZeErika Hall. May be the world’s only ZeErika. Also may have retired, but there’s no all-name team without him. Vicente Lupo: Vinny the Wolf leads the Dominican Summer League in OBP and OPS. Hengelbert Rojas: Affiliated baseball’s only Hengelbert ever, obviously. Not its first Rojas, unfortunately. Cookie Rojas is still cool though. Gregory Pron: Another one for the headlines. WRATH OF PRON! etc. Also possibly from the future.